Glastonbury is the UK’s most famous music festival. Founded in 1970, it describes itself as “the largest greenfield music and performing arts festival in the world”. The event currently resides at Worthy Farm in Pilton, covers 900 acres and attracts an estimated 180,000 people. It boasts 10 main stages and hundreds of smaller ones, catering for all musical styles, as well as comedy, theatre, circus and political debate. Wandering in on Thursday night it is possible to see anything from former champion snooker player Steve Davis spinning soul records, to Afrobeat inside a club shaped as a giant boat. And of course, among the multifarious music on offer is an assortment of reggae – alongside the forms it inspires. Every few years, rain-fall prior to the weekend turns the site into a muddy mire. 2016 is one of those years. Wellington boots and waterproof clothing are essential – and some plans are scuppered because the crowds and mud feel too difficult to manage. Even so, Glastonbury’s size and sheer variety make the festival feel like a self-contained country (the feeling exacerbated by the UK’s decision to leave the EU on the Thursday - a topic spoken about frequently on stage). In 2015, Friday’s lunchtime spot on the coveted Pyramid Stage was an audience-widener for Chronixx. His successor is Malian singer songwriter Rokia Traore. She combines traditional West African instruments such as the ngoni with an indie rock angst that is well at home here. Her grainy voice is full of tiny crystals like the pollen on a flower. The rain stops and the sun comes out during her finale. She departs to impressed applause. Over at the Blues stage, Glaswegians Mungo’s Hifi are dropping Johnny Clarke and Eek A Mouse specials with Dumfries’ Tom Spirals on the mic. Mungo’s members Tom, Craig, Doug and Jerome are present behind the decks. Their set complete, they are asked to fill in a PRS form. Good luck identifying the writers of all those rhythms! On the way to catch Protoje at West Holts Stage, a be-suited Gentleman’s Dub Club hold a huge crowd at The Glade singing Music Is The Girl I Love. Protoje’s UK appearances have been couched in the market-cracking tactical thinking he championed in his On Stage interview with Winford Williams. In 2014 he followed Chronixx to the Brixton Electric on a David Rodigan ensemble all nighter that exposed him to hundreds of potential fans (who duly came to his solo Koko show the subsequent year). Pursuing Chronixx again to Glastonbury, he is strategically spread across 4 sets on multiple stages. 2 feature his band the Indiggnation (on the high profile West Holts and the reggae themed Gully). 2 are guest spots (one joining bass specialist and Rodigan mutual friend, Toddla T; the other with Jungle producer and grandson of UK reggae legend Count Shelly, Shy FX). A misprint in the Guardian newspaper’s official programme claims he is performing a fifth slot – 3.30 at the Gully on Friday. Protoje is actually headlining at 11pm). “You're in tune to Protoje. And we brought the sunshine from Jamaica” says Oje on the West Holts at 5.30. Just like Summerjam 2015 when he averted the forecast storm, he has temporarily tamed the British weather. Indiggnation guitarist Monty and bassist Danny are wearing wellies instead of Clarks. They’ve also swapped their opening theme from the Munsters to the Sicilian sequence of the Godfather Part II. They are even tighter than Chronixx’ band – as demonstrated by their playing of the Rootsman/Birth of Reggae Music rhythm for Resist Not Evil. 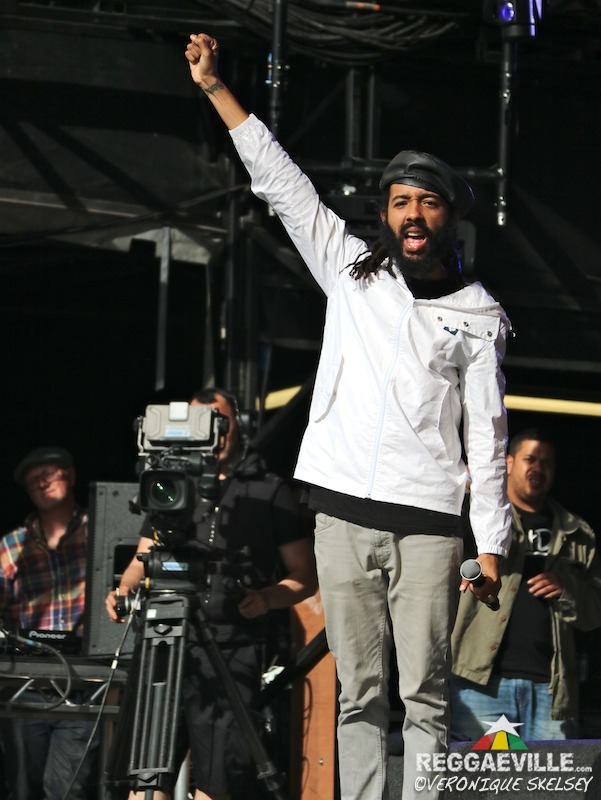 Protoje skips on in a white jacket and no wellies. He’s not afraid to get political: introducing Criminals he announces “If you voted to stay in the EU let me see your hands in air”. “I'm going to have my own election,” he adds “Who thinks marijuana should be free?” seguing from Bubbling to a briefly reinstated This Is Not A Marijuana Song. He shows his love of hip hop by hailing previous West Holts act Vince Staples. He unveils the Dennis Brown sampling Can’t Feel No Way from complimentary new album Royalty Free. Younger revellers push to the front as Proto sings his and Chronixx’ parts on Who Knows. Kingston Be Wise is reverted to InI Kamoze’s original as England Be Wise (in another canny Brexit reference). Monty and his pricy looking Paul Reed Smith guitar inject rock flavour. Keyboardist Paris reprises his vocoder work from Stylin’ to sing Smells Like Teen Spirit through the device. Protoje leaves for the Songlines magazine stand to sign copies of albums Ancient Future and Royalty Free. The line is 50 deep. He is critical of his performance. “It was ok. We made some mistakes on stage I wasn’t too pleased about. But the energy was good and I’m looking forward to the performance later to correct some stuff we didn’t get right”. Chatting to Protoje means Reggaeville misses Mr Vegas on the Blues Stage. In the particularly wellie-gobbling mud of the Field of Avalon Christine Staple, wife to the Specials’ Neville, is peering into the tent to glimpse Leeds soul singer Corinne Bailey Rae. The weather seems to have cleared. By nightfall, Scottish mc and Mungo's collaborator Soom T is asking a well-attended Gully to “take a walk in my shoes”. Her voice is an acquired taste but she sounds unique – and gives switched on advice about helping people who have taken too many drugs. Later Reggaeville checks Protoje’s longer set closing the Gully. It’s slightly heavier and dubbier with less of a rock feel. Bubbling is swapped out for Buju’s Champion and Royalty Free’s Blood Sisters’ Ring My Bell repurposing Glad You’re Home (the Sisters’ part beautifully sung by backing vocalists Shenae and Kerri). Paris extends his vocoding from Teen Spirit to Tupac’s California. It seems illogical at Glastonbury, where there are a million options, to watch the same artist twice. Yet the fun had spotting-the-difference demonstrates how good value Proto and the Indiggnation are. By Saturday the depth of the slurry is making movement quite challenging. But one performance absolutely must be attended. 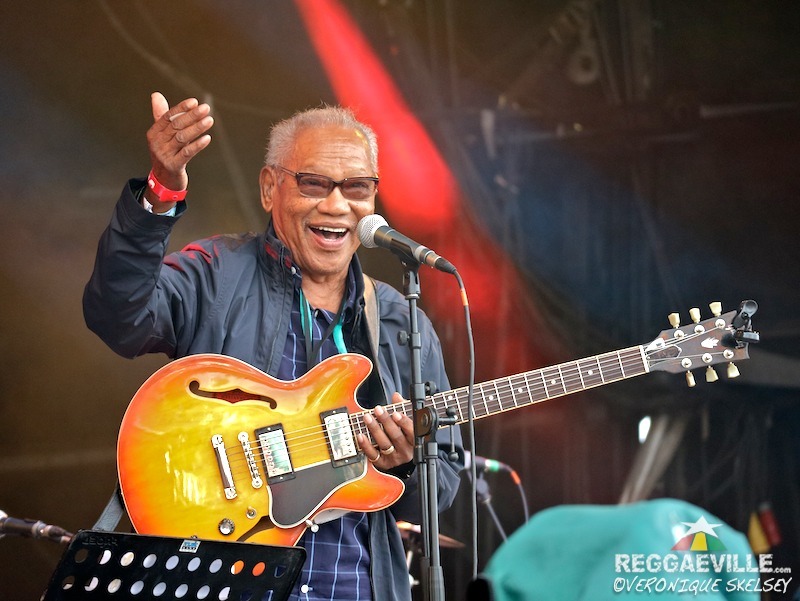 At the Park Stage, 84 year old guitarist Ernest Ranglin, who co-created ska, brought it to the UK pop charts and pinned Jamaican jazz on the map, is playing one of his final dates before retiring. (Earlier, the Park saw Brummie/St Kittitian rapper Lady Leshur start with Sister Nancy’s Bam Bam). Ernie’s band includes legendary Afrobeat drummer Tony Allen, bassist Ira Coleman on upright, pianist Alex Wilson, saxophonist Soweto Kinch and singer and multi-instrumentalist Cheikh Lo. At 6.30 a few hundred diehards gather in the swamp under a grey sky as the group tune up. “Good evening ladies and gentlemen” Ernest jokes at applause for a commencing Bourbon Street Skank “I thought we were just having a sound check! But I'm glad you enjoyed what we played! This next tune is called Surfin’”. By the time he finishes his Studio 1 signature, rendered in a hobbling crabwalk that befits the terrain, the crowd has trebled. The swirling Swaziland (which Allen and Ranglin recorded on for the project Modern Answers to Old problems) starts as an Afro-jazz number before the band masterfully bring in a one drop backbeat. Ranglin’s solos are increasingly “guitar fretboard drumming” these days - although he does some fast runs if he wants to. His muted high notes channel the nocturnal insects that inspired Jamaican percussion. He has a master arranger’s sense of what will sound right - and when. There are plenty of playful excursions into public domain melodies that show Ranglin is far from the stereotype of the imperious jazz man. During Below the Bassline, title track of his essential 1997 album with piano master Monty Alexander, he segues into the William Tell Overture. Kinch responds with Pop Goes The Weasel. Over the top of Allen’s famously gentle pitter patter throughout Ball of Fire, Cheikh Lo supplies hard cracks on the timbales that would make Skatalites hard-hitting drummer Lloyd Knibb proud. He even takes the guitar to sing two songs himself. Come evening, Adele belts bluesy pop hits on the Pyramid Stage, swearing like a docker. At the Gully, Lee Scratch Perry, festooned with badges, toddles on to rebuke David Cameron for Brexit atop I Chase The Devil. In 2015 Reggaeville covered the hottest SummerJam in recent memory and this was the one of muddiest Glastonburys. That you can trudge through the sludge yet leave with no regrets is testimony to its appeal. PHOTOS BY VERONIQUE SKELSEY - CLICK HERE FOR MORE!